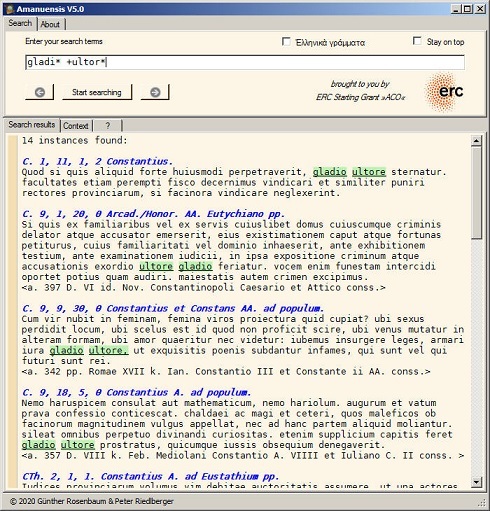 Amanuensis itself is freeware. You can use it for free (even in commercial contexts). You can also pass it on for free. However, you must in this case always clearly state the authors’ names. And remember, there is no warranty or liability whatsoever. Günther Rosenbaum is a mathematician and software developer. In 1977, he was National Champion in the German National Mathematics Competition. Peter Riedlberger is a classicist and IT aficionado. He's interested in late antique legislation and Acts of Ecumenical Councils, among other things.